Per a tweet from Tom Haudricourt, the Brewers have indeed identified the player they will be receiving from the St. Louis Cardinals to complete the trade for veteran reliever John Axford. 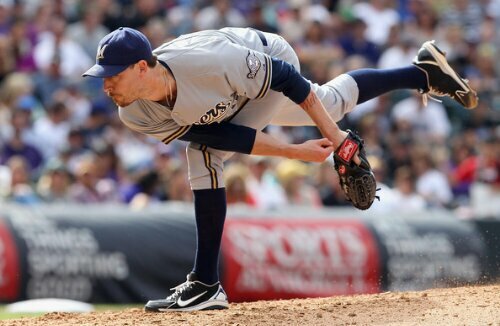 RHP Michael Blazek is indeed player to be named for #Brewers in John Axford trade. So let’s learn a little bit about the newest Brewers relief prospect. Michael Robert Blazek is a 6’0″, 200 lbs right-handed power relief pitcher who was originally drafted by the Cardinals back in the 35th round of the 2007 First-Year Player Draft. He turned 24 years old earlier this season and made his big league debut on June 22nd of this year. Blazek struggled early in his minor league career and sports a career 4.13 ERA as a result. Being able to throw in the mid-90s usually gets you some time to develop, especially since he was signed out of high school in Nevada. This year has been a revelation for the player who was ranked as the Cardinals’ 5th-best prospect prior to the trade by MLBPipeline.com. Just two years ago, Blazek was a starter who had reached Triple-A. With a four-pitch mix, it seemed his ceiling was that of a No. 4 or 5 starter. After seven ineffective starts in 2012, however, the Cardinals moved the right-hander into the bullpen, and he posted a 2.59 ERA and .182 batting average against in 33 Double-A outings. Blazek pitched with an average fastball as a starter, but he was up to 95 mph out of the bullpen, and it might be plus more consistently if he stays with shorter stints. He still has three secondary pitches in his curve, slider and changeup that have the chance to be Major League average. It seems like the Cardinals will stick with Blazek as a reliever, giving his stuff a chance to play up and get him to the big leagues faster. That was written prior the start of the 2013 season. Stay tuned for where he’ll be ranked on the Brewers’ list after the trade is officially completed. So far in 2013, Blazek pitched at both Double-A and Triple-A in the Cardinals organization before making his MLB debut. Combined in the minors he threw 45.2 IP over 36 appearances. He compiled nine Saves and a 1.97 ERA. His WHIP was 1.182 as he allowed just 28 hits and 26 walks. And his K/9 and K/BB were 10.2 and 2.0 respectively with his 52 total strikeouts. Those are certainly numbers that are encouraging. However, once Blazek reached the major leagues his command struggles became more pronounced. He walked 10 in 10.1 IP to go along with 10 hits allowed, including two home runs. He did strikeout 10 as well, so the potential to “miss bats” at the big league level has certainly manifested itself early. But a WHIP near 2.00 as a relief pitcher won’t get it done. Nor will his ERA which sits at a robust 6.97 right now. Some of that is small sample size fun, and Milwaukee’s pitching coaches will help him refine his mechanics and whatever else needs some help to get him to realize a bit more consistency. He’s certainly a name that you’ll need to know about heading into next year’s Spring Training…that is, assuming he doesn’t come to Milwaukee for the balance of the 2013 season. Milwaukee Brewers have acquired a player to be named from the St. Louis Cardinals in exchange for right-handed reliever John Axford. In a corresponding roster move, the Brewers have recalled right-handed pitcher Alfredo Figaro from Triple-A Nashville. Figaro is 2-3 with a 4.25 ERA in 26 games (5 starts) with Milwaukee this season. 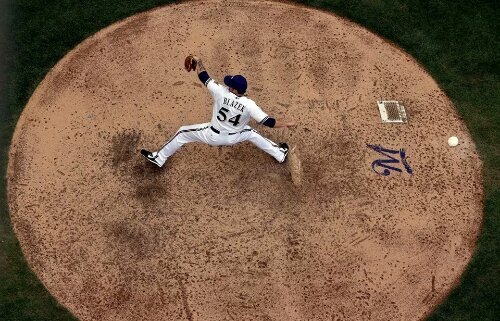 Has the Real John Axford Stood Back Up? John Axford began the 2013 season as the Milwaukee Brewers closer and, more telling, as the longest tenured member of the Milwaukee Brewers bullpen. Gone were holdovers and friends, colleagues and mentors, teammates and Brew-Tang Clan members. After struggling through much of 2012, the playoff push that the Brewers put together in August and September last season was fueled in no small part by the resurgence of Axford as closer. He was good again. He entered 2013 coming off of an okay run with Team Canada and a handful of lukewarm outings in Cactus League play, but he was the closer. There was no doubt that he would start the season firing on all cylinders. Except that then he didn’t. I take some guff on Twitter for when I support Axford in Save opportunities. I tweet a simple hashtag when he’s entering the game in a Save opp. “#JohnAxfordSaves” is all it reads. It was a play off of his follicle situation in 2011 when he got on his incredible consecutive Saves streak. He had long hair, great facial hair, and was saving games. It worked. No one complained in 2011. People would wait for the tweet, expect the tweet, and retweet the hell out of it. We had fun. Then 2012 happened and Axford blew a whopping. astronomical, unbelievable, unfathomable, ridiculous, asinine… nine Saves. He saved 35. But those nine failures in a game of failure led a handful of people to whine about the use of the hashtag. I kept it going this year in the lone opportunity that he had. I’ll use it again in his next opportunity. I make mention of the hashtag situation because the next opportunity Axford gets certainly seems like it’ll be coming sooner rather than later. In comments to the media this past week, Brewers manager Ron Roenicke said that it might not take much to give Axford the closer’s job back in Milwaukee. I won’t break down bullpen roles and personnel utilization here, but let’s focus on why Roenicke felt it was okay to make that statement. John Axford appears to be back. In his first four appearances of 2013, Axford’s results were pretty bad. Ironically, his best outing of the group was the one in which he blew his only Save chance this year when Dexter Fowler (who has since shown a much more powerful approach this season) jumped a first-pitch fastball in a bad location for a solo home run. Ax struck out the side around that pitch, including walking no one. Then, over the next three games Axford allowed a combined eight earned runs on eight hits and two walks over just 2.1 innings pitched. His ERA sat at 24.30 and some fans who only remembered the number nine instead of 35 and 46 were calling for his role, job, spot on the roster, and anything else within (and a couple completely outside of) reason. I said it during last season, but Axford was so good in 2011 that he was set up to disappoint casual fans in 2012. He simply couldn’t be expected to maintain that level of success. There’s something called “sustainability” when looking at trends and averages and the like in statistical analysis of this great game. Guys hit well over .400 for stretches during the season, as an example, but there’s a reason nobody has hit .400 over an entire season in such a long time. In short, Axford shouldn’t have been expected to go 46-for-48 again, but some people did expect it and wildly jeered him when he didn’t deliver. When Axford is “right”, he’s got upper-90s velocity, he keeps his fastball down in the zone as the norm, and can throw both of his off-speed pitches for strikes. His fastball has always been a bit straight, but location helps and being able to keep hitters off of it with the curveball and slider is important as well. When Axford was struggling to start the season, his velo was down and despite having relatively good command, he was getting hit pretty hard. Axford has put together a run of six scoreless outings since that early-season blowup. He’s thrown 5.1 innings and allowed exactly two hits and zero walks. Over that same span he’s also struck out six batters. The first couple of games in this mini-run were certainly encouraging, but Axford would still give up some hard hit balls and his fastball would sit 93 and touch 95. Then the appearance in San Diego really started to puts some doubters — though somehow not most — at ease. Coming out of the visitor’s bullpen to work an ultimately clean inning, Axford had the velo back. He was hitting 97 MPH on the radar gun and kept the ball down in the zone. It was a truly vintage Axford performance. Those are words that fans would definitely prefer to hear right now as Henderson has been perfect in Save opportunities so far in 2013, but given Axford’s disposition and attitude, you have to think he isn’t just blowing the proverbial smoke. Reporters then asked Axford about the rediscovery of his lost velocity. Axford admitted that there was “a very subtle change” in his mechanics that both pitching coach Rick Kranitz and bullpen coach Lee Tunnell helped identify and fix. With the big fastball back and still commanding all of his pitches, Axford certainly has the look of someone who has returned to the form that netted him both Cy Young and MVP votes after the 2011 season. Will there be hiccups along the way? Yes. Expect some, don’t freak out every time something goes wrong, and you’ll enjoy these games a lot more. As for the hashtag, it’ll be there in all its superstitious glory just as soon as it’s accurate to do so. Happy 43rd Birthday To…All Of Us! …the birthday is listed as April 1st. Some people think that I set it up that way because Opening Day happens to be on April 1st this season or because my personal birthday is April 1st. I didn’t realize how many people actually didn’t get why I have it listed at April 1 though. If you look more closely, the year on the birthday is always listed as 1970. Why? ON THIS DATE IN MLB HISTORY: April 1 – The Milwaukee Brewers organization, headed by Bud Selig, purchases the Seattle Pilots franchise for $10,800,000. Although negotiations were conducted over a period of months, it was not until March 13 when a federal bankruptcy referee declared the Pilots bankrupt. Brewers tickets go on sale the next day. Team equipment is shipped to Milwaukee County Stadium, where the Pilots insignia is ripped off of the uniforms, since there is no time for new uniforms to be made. The year of that even was 1970. The Seattle Pilots were an expansion franchise who played in Seattle in 1969 but then were sold with less than a week to go before the start of the 1970 season. Opening Day for the new Brewers was April 7, 1970 but the team officially became Milwaukee’s on April 1st. As this community is a centralized representation of all of the fans of the Milwaukee Brewers, the birthday of being a fan of the Brewers is the appropriate birthday for The Brewer Nation. I may write everything that gets posted on the blog these days, but this is still about all of us. It’s about getting information and opinions out to us fans so that we can collectively apply our fanaticism. So today, if you’re so inclined to think about firing off a Facebook wall post or a tweet or what have you…thanks! But please realize that you’re also wishing happy birthday to yourself because as a fan of the Milwaukee Brewers and therefore a member of the Brewer Nation, it’s your birthday too! 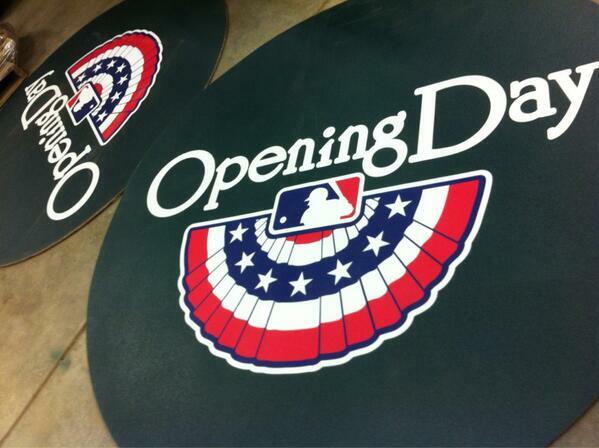 Oh, and since there is the coincidence of Opening Day being on our birthday, let’s hope the team picks something nice up for us at Miller Park today and gift wraps our first Opening Day victory in five seasons!